At SaffronStays, safety and trust of our host and guest community is the top most priority. We want you to enjoy every bit of your booking and stay experience with us. We allow our hosts and guests to verify their email addresses online, as well as verify their mobile numbers using online verification methods such as OTP and email verification. Our featured hosts are personally visited and verified by our verification staff. They ensure the correct geo-codes are captured, pictures taken/ verified and amenities and description checked prior to according them the status of 'featured host'. This is done on a best-effort basis and does not offer a guarantee from SaffronStays. Social Media - In today's connected world, this is an important way to make sure their SaffronStays profile is genuine. Don't take our word for it, read up on what other users say. SaffronStays encourages Guests to write up on their stay experience. From others' experiences, a Guest can gauge the standards of a Host. Both Guests and Hosts can also rate each other after the stay has been completed. A user's "Trust Meter" Score is based on this rating and will give you the comfort you need whether you are travelling or hosting. 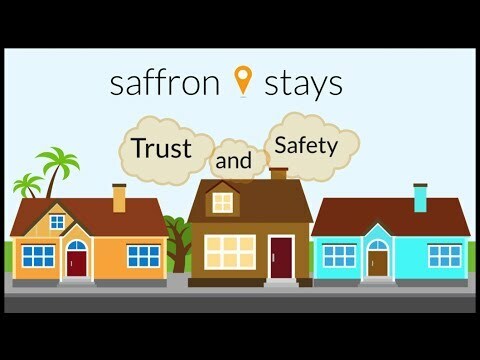 Apart from a user's Trust Meter, every Listing on SaffronStays is additionally rated through location, accuracy, safety and cleanliness. There is always a chance of disputes on refunds, whether you're a Host or a Guest. SaffronStays has a reliable refund policy which protects your interests. Though we leave selection of a Cancellation policy to our Hosts, Guests will always know these details before making a final decision to stay there. These cancellation policies have been defined to protect interests of Hosts as well as Guests. Plus, we're built on a secure platform that prevents cyber thieves from stealing your information. You'll notice SaffronStays even has a SSL Server Certificate and the site and its data is protected by a 128 bit encryption. Wherever you are, we're just a call or email away. Don't hesitate to call if you have any issues or complaints and we'll get back to you. Except in cases where the booking has been flagged off as a cash booking, a Guest pays the entire amount in advance. This amount is kept securely in a separate account and the appropriate amount is sent to the Host 24 hours after the Guest checks in. However, at times, at discretion on SaffronStays, payment maybe made in advance in order to secure a booking for the Guest. Further, an advance payment ensures that no-shows are avoided, and thereby protect the Host as well. No one wants an unruly guest in their house. SaffronStays aims to maintain high standards for our Guests through the Guest Responsibility policy. Every Guest is expected to adhere to the Host's house rules and maintain cleanliness of the place. To learn more about Trust & Safety in our community, watch this video.